MMWD’s reservoirs are currently at 94% of average storage for this date and 64% of capacity. Consumption is down 14% this week vs. this same week last year. As a reminder, new outdoor water restrictions are in place. In addition, the MMWD Board of Directors’ call for 25% voluntary rationing is still in effect. We encourage customers to take advantage of the district’s many conservation programs and rebates. Get more information here. Thank you for continuing to conserve! The rain that fell last week on the Mt. Tamalpais Watershed measured 0.21 inches, bringing total rainfall to date (July 1-September 21) to 0.25 inches. While the small amount of rain was enough to be measured and to help settle the dust, it did not contribute to higher reservoir levels. Reservoir Levels: As of September 21, reservoir storage is 51,662 acre-feet,* or 65% of capacity. The average for this date is 55,148 acre-feet, or 69% of capacity. Total capacity is 79,566 acre-feet. Rainfall: Rainfall this year to date (July 1-September 21) is 0.25 inches. Average for the same period is 0.52 inches. Water Use: Water use for the week of September 15-21 averaged 25.19 million gallons per day, compared to 30.06 million gallons per day for the same week last year. Creek Releases: During the month of August 2014 MMWD released 164 million gallons, or a total of 504 acre-feet, into Lagunitas and Walker creeks in west Marin for habitat enhancement. MMWD reservoir levels are now 92% of average, which may be a surprise to many during this dry year. Our reservoir levels have actually held steady at this same ratio for several months now, thanks in part to customer conservation efforts and also to water system operational changes. The more water we can keep in the reservoirs now, the better off we are later. 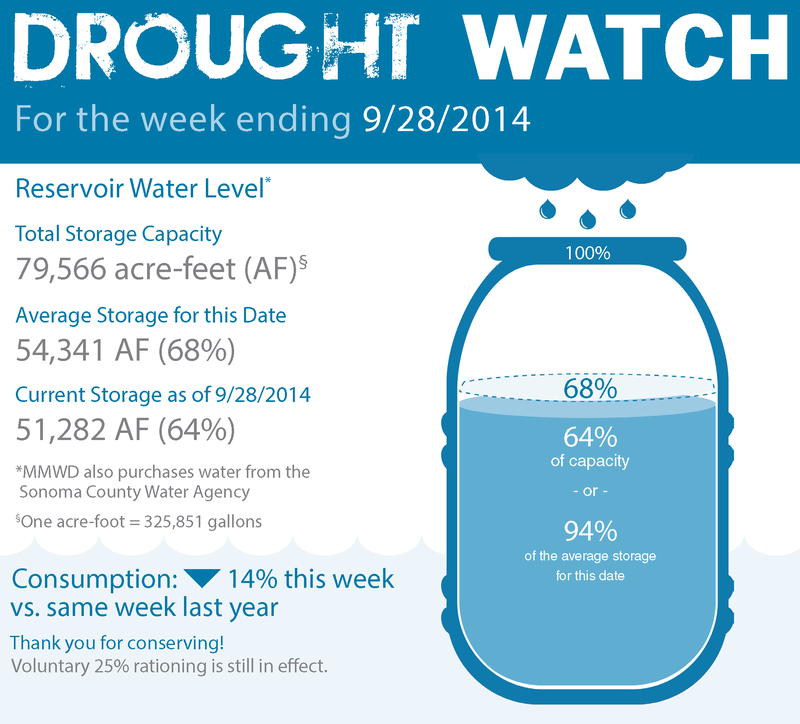 Reservoir Levels: As of August 25, reservoir storage is 53,843 acre-feet,* or 68% of capacity. The average for this date is 58,648 acre-feet, or 74% of capacity. Total capacity is 79,566 acre-feet. Rainfall: Rainfall this year to date (July 1-August 25) is 0.04 inches. Average for the same period is 0.12 inches. Water Use: Water use for the week of August18-25 averaged 27.32 million gallons per day, compared to 31.79 million gallons per day for the same week last year. Supply Source: Last week we averaged 20.03 million gallons per day from our reservoirs and 7.29 million gallons per day from the Russian River. Creek Releases: During the month of July 2014 MMWD released 171 million gallons, or a total of 524 acre-feet, into Lagunitas and Walker creeks in west Marin for habitat enhancement. MMWD’s water production for the period February-June 2014 was 15% lower than production for the same period in 2013. Many thanks are due to district customers for quickly heeding the MMWD Board of Directors’ January 21 call for voluntary reductions in water use. The board took that action just days after Governor Jerry Brown requested statewide voluntary reductions in water use. The 2013-14 rainfall year ended on June 30 with a total of 33.4 inches, which is approximately 64% of the long-term annual average. By contrast, total reservoir storage at the end of the 2013-14 rainfall year was 90% of average. The near-normal storage levels are due to unusually high rainfall in February, customer conservation efforts, and higher Russian River water deliveries. Reservoir Levels: As of July 22, reservoir storage is 57,524 acre-feet,* or 72.3% of capacity. The average for this date is 63,144 acre-feet, or 79.36% of capacity. Total capacity is 79,566 acre-feet. Rainfall: Rainfall this year to date (July 1-July 22) is 0.03 inches. Average for the same period is 0.04 inches. Water Use: Water use for the week of June 14-20 averaged 28.29 million gallons per day, compared to 31.38 million gallons per day for the same week last year. Supply Source: Last week we averaged 20.76 million gallons per day from our reservoirs and 7.53 million gallons per day from the Russian River. 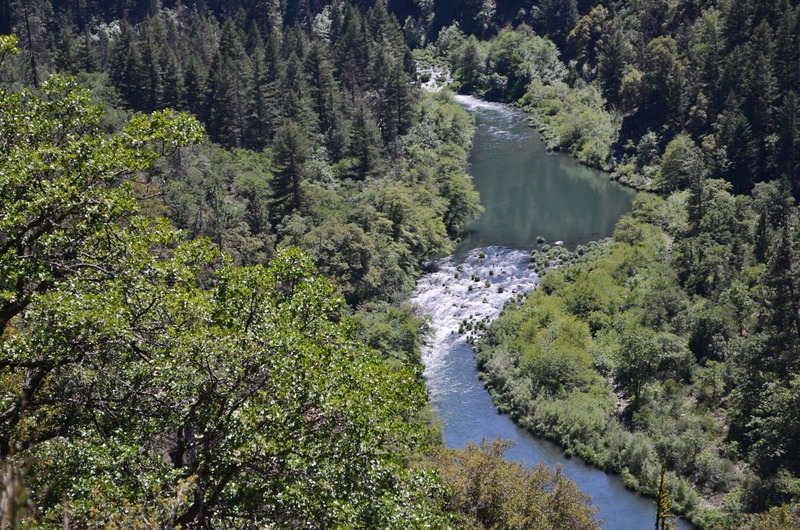 Creek Releases: During the month of June 2014 MMWD released 200 million gallons, or a total of 614 acre-feet, into Lagunitas and Walker creeks in west Marin. Water use and reservoir figures can be found on the Water Watch page of our website. The rainfall year ends on June 30 and in all likelihood we will not receive much, if any, additional rain in the remaining few days. Total rainfall at Lake Lagunitas for the rainfall year ending June 30 will top out at around 33.40 inches, which is about 64% of the annual average. This marks the third consecutive year of below average rainfall, and the reservoir storage levels reflect those low numbers. The current reservoir storage is the lowest it has been for this date since the early 1990s. If not for the ongoing conservation efforts of our customers, and the especially heavy rain in February, we would be in a far worse position than we are today. The MMWD Board of Directors’ call for 25% voluntary rationing is still in place and current consumption figures show reduced water use. We appreciate everyone’s conservation efforts and we encourage customers to take advantage of the district’s many conservation programs and rebates. Get more information here. Reservoir Levels: As of June 22, reservoir storage is 60,533 acre-feet,* or 76% of capacity. The average for this date is 67,290 acre-feet, or 85% of capacity. Total capacity is 79,566 acre-feet. Rainfall: Rainfall this fiscal year to date (July 1-June 22) is 33.40 inches. Average for the same period is 52.56 inches. Water Use: Water use for the week of June 16-22 averaged 28.78 million gallons per day, compared to 32.27 million gallons per day for the same week last year. Creek Releases: During the month of May 2014, MMWD released 218 million gallons, or a total of 669 acre-feet, into Lagunitas and Walker creeks in west Marin. We release water throughout the year to maintain adequate flows for the fishery per our agreements with the State of California. There is a line in The Velveteen Rabbit by Margery Williams that has stuck with me over the years: “Once you are Real you can’t become unreal again. It lasts for always.” I can think of several turns in life where those lines sculpted who I am today. Odd as it might be, one of these specific changes involves water and how it is used. I’ve developed a sensitivity to both water conservation and water waste. It is an awareness that doesn’t go away once you’ve walked through that gate. A friend and retired employee who I worked with at MMWD recently moved out of state. While gainfully employed at the district, Ken Feil and I worked in different departments with different responsibilities, yet we both kept an eye open for water waste as well as good conservation practices. Although we have retired from our positions, the awareness of water remains. Not long after Ken and his wife Peg moved, I got a call from them. Their beautiful new home was professionally landscaped; however, their first sight of the irrigation system in action was water spewing in every direction including halfway into the street. One station had four different types of sprinkler heads, which required running the water for hours to keep some of the plants alive. Ken’s conversation with the landscape maintenance company caused further consternation: The company’s response was that the water only cost $75.00 a year and they are sitting on one of the largest underground aquifers in the United States. I am not certain if these folks are still employed at Ken and Peg’s home, but I can bet they are more educated now! A knock on the door this week found my downtrodden neighbor carrying a letter stating that all irrigation to his planted fields must cease and desist. The water rights from tributaries, streams, and creeks in the area that feed the Sacramento River are to “flow free.” All the crops that feed his livestock will wither in the hot summer sun. All the hours of plowing and planting were for naught. Water in Lassen is plentiful, but unlike Ken and Peg’s landscaper, we know the groundwater can be diminished if we are not aware of surrounding conditions. We can only hope that those on the receiving end of the water we let flow freely will appreciate the sacrifice others made and not waste it. I found comfort in this thought shortly after our neighbor’s visit. Another call came in from the neighbor living across the street from my mom’s house in Marin. She wanted us to know that a riser popped off the sprinkler system and was gushing over the landscaped area. I really appreciated her observation and taking the time to call so it could be repaired. Her call also let me know that the conservation efforts and education by those at MMWD are working.